This was an 11 day repositioning cruise from New York City, where Carnival Vista was officially named, to her new homeport of Miami, Florida. The ship called in Bonaire, Aruba and St. Maarten. 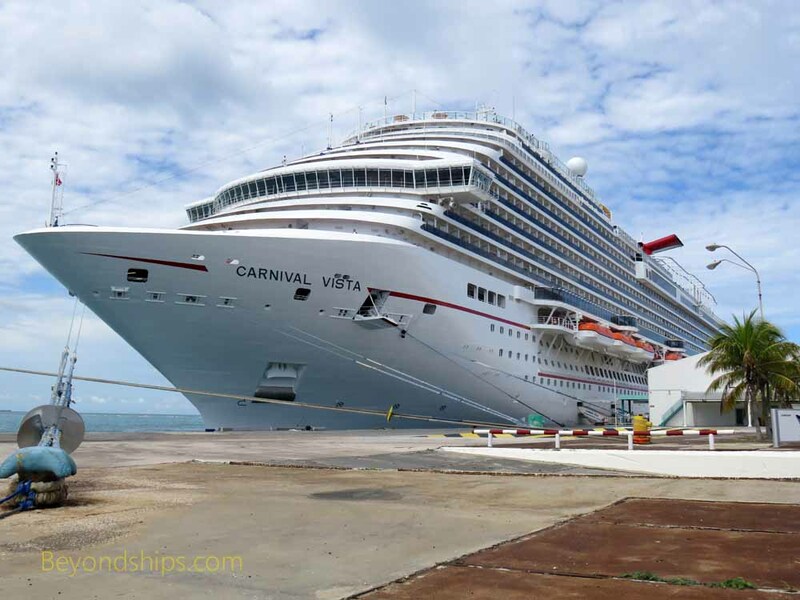 Carnival Vista is a large family-friendly ship. She is an evolution of what Carnival has done before, rather than a revolution. Ideas and concepts that Carnival has nurtured over the years continue on Carnival Vista, usually in an enhanced fashion. There have also been additions. Some are entirely unique to Vista such as the IMAX theater while others have been borrowed from elsewhere in the industry. Overall, she is the most formidable ship in the Carnival Cruise Lines' fleet. The cruise experience provided by a ship is not just a function of its hardware but also depends upon who is operating that hardware. On this cruise, the officers and crew were a mixture of people who had been with the ship for its initial European season and people who were coming aboard for her new life in the Caribbean. Despite this mix, the officers and crew were uniformly friendly and competent. The décor of Carnival Vista is much different than most Carnival ships. It continues the more subdued, contemporary style that was first suggested on Carnival Dream and which came to full fruition on the revitalized Carnival Sunshine. This styling is more like what you would expect to find at a modern hotel, perhaps more restful and up-to-date. On the other hand, these interiors are not as imaginative as the earlier designs and each ship is not as individualized as before. Nonetheless, I would have to say that I found Vista's interior to be an enjoyable environment. The layout of the interior is similar to the layout of Carnival's Dream class ships. Those ships were an improvement on the layout of the Conquest class. Some things have been added and some things are in different locations but if you are familiar with Carnival's earlier ships, you should not get too lost on Vista. One change that we did not care for was the layout of the Lanai. Starting with Carnival Dream, the Carnival ships have had an outdoor promenade that encircles the ship. On Vista, this concept has been developed so that there are bars and dining venues on the Lanai much like on Norwegian Cruise Line's Breakaway class ships. As a result, the Lanai is a more interesting area. I also liked being able to walk to the front of the ship at night where the lighting has been reduced to allow the officers on the bridge better visibility. On a clear night, the stars are much brighter than you typically see on land. In addition, we had several nights where the lights of other nearby ships floated in the darkness. A portion of the Lanai is now exclusively for guests staying in the ship's Havana suites. As a result, you can not walk 360 degrees around the ship as you can on the Dream class. Most of the major cruise lines (e.g. Norwegian, Royal Caribbean, MSC) have created areas that are for the exclusive use of suite guests on their most recent ships. In effect, it is a return to the traditional two class system. There is nothing per se wrong with this concept as it is quite common in shoreside hotels. However, this is the first time such a visible space on a ship has been cordoned off. Considering the popularity of 360 degree promenades both among passengers and reviewers, this is a controversial move. The Havana suites are designed to provide a Cuban-style resort atmosphere, your own private island resort. The ones bordering the Lanai have their own outdoor areas that extend out further than the balconies of the cabins above them. These areas are enclosed by a low fence and are equipped with such things as loungers and swinging chairs. During the day, guests staying in these accommodations have exclusive access to the Havana pool and hot tubs at the stern of the ship. I understand that they have been booked quite far ahead into Vista's schedule. Another popular feature on Vista is the Skyrider. Located at the top of the ship, this is in essence an individualized monorail system. Guests power the cars that hang below the rail by pedaling like on a bicycle. The course covers the back half of the ship. On the days with good weather, the Skyrider appeared to be in constant use. In addition to the Skyrider, Vista has an extensive outdoor activities area. It includes a ropes course, sveral waterslides and more traditional facilities such as a basketball court and a jogging trail. As on all Carnival ships, Carnival Vista has two main dining rooms. The Horizons Restaurant aft is two decks high and is an impressive space. The Refelections Restaurant is one level and is located midships. Only the Horizons Restaurant is open for breakfast and lunch (sea days only). On three of the seven sea days on this cruise, breakfast and lunch were combined into a Sea Day Brunch, with a different menu. As a matter of personal taste, we prefer the separte breakfats and lunch over the brunch as the menus are more focused but the brunch is good for a change of pace. For dinner, both restaurants follow the same menu. However, Horizons, the aft restaurant, is on a flexible dining system. Refelections, the smaller restaurant, follows the traditional two seating system. On the cruise elegant (formal) nights, the tables were covered with table clothes. On other nights, the utensils were on the bare table. I did not have a bad meal in either of the main dining rooms. The variety was good, the food plentiful and nicely prepared. The dinner menus were quite varied offering familiar favorites (e.g., lobster, Beef Wellington) plus exotic specialties (e.g., alligator) and dishes that related to the ports of call. There were several nights where it was hard to choose which items to have. As a result, ordering more than one main course was not uncommon. ​The matire d' in Reflections was Carnival's veteran matire d' Ken Byrne who entertained the guests each night with his performances of a number of songs made famous by Frank Sinatra. Following Ken's much appreciated renditions, the waiters would dance and sing - - a Carnival tradition. Vista offers several specialty restaurant alternatives. I tried three of these and were not disappointed by the experiences. (See separate review). Carnival Vista has an extensive list of casual dining venues as well. Top of the list is the Guy's Burger Joint. You can either order one of the burgers designed by celebrity chef Guy Fiere or order a plain burger and then add any or all of the toppings presented in the adjoining counter. Yes, the burgers are high in calories but they currently have our vote as the best tasting burgers at sea. Opposite Guy's Burger Joint on the port side of the main pool area is the Blue Iguana Cantina where you can have made to order burritos and tacos. There is also an adjoining salsa counter. Again, very good. On the Lanai, Vista has the Pig and Anchor, a barbeque counter also developed in conjunction with Chef Fiere. While this was very popular with the guests, I prefer the burgers. Vista offers 24 hour pizza aft by the Tides Pool. At one time, Carnival had the best American style pizza at sea. However, someone decided to switch to a thin crust model. Although fresh baked, the crusts do not have the flavor to make it as gourmet pizza and the toppings are rather mundane. At the other end of the food spectrum, Vista has an outdoor counter in the adults-only Serenity area where you can get a made to order salad. Similar to the Tutti Salad bars on the Royal Caribbean ships, you tell the person behind the counter which of the many ingredients spred out on the counter you would like included in your salad. The staff member then mixes the ingredients together with a dressing of your choice and places them in a large plastic bowl. It is a very good salad. The only problem is that on a day when the weather is nice, it is hard to find a place to sit in the Serenity area at lunchtime. Consequently, you may be forced to take your bowl to some other part of the ship. The main entertainment venue is the Liquid Lounge. The ship's production cast put on four shows during the course of the cruise. These were high energy revues, each with a different theme - - disco, Cuban, American rock and movies. At one point, Carnival attempted an experiment where the entire cast were both singers and dancers. This was not particularly successful and now on Vista, the cast has been augmented with four members who are dance specialists. We believe this was a good move. In addition to the production shows, several visiting performers appeared in the Liquid Lounge including singer Marcus Anthony, magician Marcus Monroes and hypnotist Rich Guzzi. The Lounge was also used for Hasbro the Game Show and other activities featuring the entertainment staff. Vista's second large entertainment venue is the Limelight Lounge. It is used for a number of different activities but primarily it is the home of the Punchliners Comedy Club. The seating is arranged theater style which works better than the cabaret style venues that are used as the comedy club on some of the earlier Carnival ships. There were always two comedians aboard throughout the cruise but they were not the same comedians throughout. Comedians departed and new comedians arrived in the different ports of call. Generally, there were four shows each night - - two PG shows and two adult shows. Thus, the comedy club offered quite a bit of variety. A popular feature on Vista is the IMAX Theater, the first of its kind at sea. For an additional charge, guests can see films currently being shown at IMAX theaters ashore. Next, to the IMAX is the Thrill Theater, a 4-D movie venue where guests can feel the wind in their face, the seats shake etc.. For a more traditional movie experience, Vista shows recent films on the large video screen mounted above the main pool area. This cruise was a Carnival Journey cruise. Carnival designates certain longer cruises as Carnival Journeys. On these cruises, there is an enhanced enrichment program with a presenter (in this case, Tom Parks) who lectures on various topics (e.g., photgraphy, social media). Along the same lines, there are onboard events such as the “Throwback Sea Day” in which there are events that once were common on cruise ships but which somehow got lost over time such as the captain's cocktail party and the midnight buffet. There are also unique shore excursions beyond those usually offered on Carnival ships. In addition, the itinerary usually includes ports that Carnival does not often visit. All of this greatly enhances the cruise experience. Most of the mass market lines struggle with what to do with sea days and hence guests sometimes are wary of cruises with several sea days. The Carnival Journey programming makes the sea days more fun and interesting. (They are an addition to the schedule, so you have your normal sea day activities as well). In addition, the Carnival Journeys programming gives guests a taste of the kind of offerings that are typically the domain of the premium and luxury brands. Part of the original Carnival philosophy was to give guests a taste of luxury cruising and so this program is very consistent with Ted Arison's original vision. Many of the passengers on this cruise were experienced Carnival cruisers. Quite a few were in the upper levels of Carnival's loyalty program. In general, they seemed to enjoy Vista. The most frequent complain we heard was that the Liquid Lounge is too small for the number of people on the ship. There were also some new cruisers including a surprising number of children considering that the schools in America were in session. The ship's organized children's programs absorbed most of the kids and so they were not visible most of the time. Although this cruise began in New York, the passengers were from across the United States and Canada. There were very few guests from outside of North America. Carnival Vista has good sea keeping qualities. She is not meant to be an ocean liner but she does have a comfortable ride. Although azipod propulsion is common on the ships of most of the other Carnival Corporation brands, Carnival Vista is the first Carnival Cruise Line ship to have azipods in many years. Not only is this an aid to maneuverability but there is less vibration. Indeed, we had a stateroom aft on Deck 1 - - an area normally subject to noise and vibration - - and found it to be quiet and stable. Vista did encounter some storms on this voyage. They caused some rolling but not enough to inconvenience the guests. The bottom line is that this was a very good cruise. I particularly liked Vista's more upmarket décor. There was also a lot to do on this cruise. The service in the restaurants and for the cabin was also very good.